The word is out that the population of Monarch butterflies is decreasing. These insects have delighted legions of children on the North American continent for generations and the thought of their demise is distressing to many. Since the caterpillars require milkweed to thrive, residents of cities, suburbs, and rural areas are concentrating their efforts on propagating the species to ensure the survival of this wondrous species. 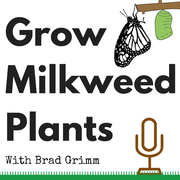 If you have never grown milkweed before, here are some tips that will help your plants grow to be strong and healthy to nurture the Monarch caterpillars long enough for them to reach their butterfly adulthood. Of course, if you can grow them from cuttings, they will do much better. They should be placed into distilled water for four weeks in order to develop a large root system. The great thing about these two methods is that you can get started on these projects while it is still cold outside and your plants will get a head start on the growing season. Prepare a garden space that will accommodate at least six plants. When Monarch caterpillars start eating, they are very, very hungry. By giving them access to multiple plants, you create a better opportunity for more of them to survive to adulthood and, after all, isn't that the whole point of growing milkweed in the first place? If you do choose to grow your milkweed in a container garden, you can overwinter them and place them back outside in the springtime for bigger plants that season. Overwintering works for most milkweed varieties, but not all. Move them indoors once they have stopped producing flowers or fruits. Once indoors, remember that they will still need to be watered all winter long. Perennial milkweed will go dormant in the winter and can remain potted outdoors throughout the winter. Once you begin growing your milkweed plants, you can either wait for wild milkweed butterflies to show up to lay their eggs or collect caterpillars from nearby milkweed and place them on your plants. Watching these caterpillars grow to adulthood makes it worth all the work in the spring. Jonathan Leger is a member of the Garden Writer's Association and a gardening enthusiast.